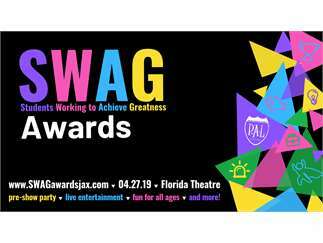 JaxPAL is ecstatic to host the inaugural SWAG (Students Working to Achieve >The SWAG Awards is truly a celebration of students who are working to achieve greatness and make our community (and the world!) a better place and the adults and companies who are playing a key role in inspiring, motivating, and advocating for them! The award categories include advocacy, academics, athletics, entrepreneurship/corporate social responsibility, and volunteerism. In addition, there will be a special PAL and first responders award. Nominations will be open February 10th through March 26th. The SWAG Awards is more than just an awards show. It is a fun, high energy, family-friendly event that will feature a pre-show party, show stopping performances from local youth groups, fun for all ages, giveaways, and more! Visit www.swagawardsjax.com for more information.